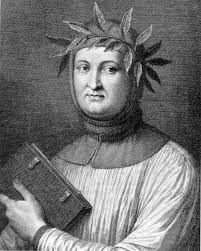 Petrarch (Fransesco Petrarca) (1304–1374) is an Italian poet who has significantly influenced western verse. His sonnets were particularly admired. The form — known today as the Petrarchan sonnet — begins with an octave (ABBAABBA) followed by a sestet (often in the pattern CDECDE). This form is easier to accomplish in Italian than English, which is perhaps why the translation below doesn’t seek to perfectly echo it. He grew up in southeastern France, after his parents were banished from Florence. In 1341 he was crowned poet laureate in Rome. For 21 years — right up to her premature death — Petrarch maintained an obsession for a beautiful woman, named Laura, who was unobtainable for him because she was already married. In The Canzoniere, are collected the poems expressing his love for her, and his sorrow after her death. He is called the father of humanism; he believed Christian faith was not incompatible with realizing humanity’s potential. He was devoted to Christ, and sought to demonstrate the closeness of Christianity to major philosophic thought. My bitter foe might hold it in despite. Show them this day you were on Calvary.